1) CHECK THAT FANDANGO.COM sells TICKETS to YOUR LOCAL THEATERS! 2) *BIG TIP* INVITE people DIRECTLY - BY TEXT, CALL, IN-PERSON, & email. YOU WILL ALSO RECEIVE A DIRECT LINK TO BUY TICKETS! We are also sending you a unique LINK direct to Fandango that you can email and post. It will track any tickets your supporters buy through it! Let people know INSTANT FAMILY will be a fundraiser for your cause. $1.00 FROM EVERY OPENING WEEKEND MOVIE TICKET—BENEFITS YOUR CAUSE—WHEN PEOPLE SELECT YOUR CAUSE ON FILMRAISER.COM/TICKETS BEFORE PURCHASING—or IF THEY BUY THROUGH YOUR LINK. Any ticketS bought now & through thanksgiving, UNTIL Dec 3 count! Invite friends in ANY other U.S. cities. ANYONE can select your cause! TICKETS ARE ON SALE 10.26.18! And CLICK through to Fandango. All tickets bought will track to your cause. Your School Name or Cause. Click to download in black & white. This image shows where the name of your cause can be added. 1) Download the BLANK POSTER to your computer. 2) Open Canva. Create 8.5"x11" page. 3) Upload your blank poster poster to Canva. 4) Add text on top. Size the text to fit. 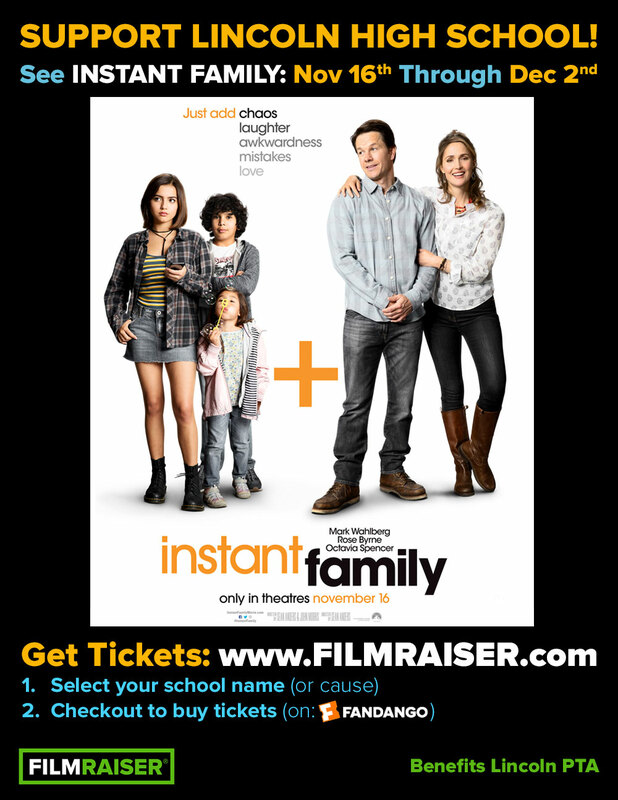 Go see INSTANT FAMILY and $1.00 per ticket will benefit [INSERT CHARITY NAME]. Get tickets at www.Filmraiser.com, select [INSERT CHARITY NAME], and checkout via Fandango. #InstantFamily will be donating $1.00 per ticket to benefit [INSERT CHARITY NAME]! Please go to www.Filmraiser.com and select [INSERT CHARITY NAME]—you will checkout via Fandango. We have a unique opportunity to raise funds for [INSERT NAME OF CAUSE]—as Paramount and the movie INSTANT FAMILY are donating $1.00 per movie ticket to our cause. Please help us spread the word to see the film opening weekend November 16, 17, 18 (sales count through Dec 2nd). Tickets are on sale 10.26.18! For sales to count: Get tickets using this Fandango link to support us: [COPY & INSERT YOUR UNIQUE LINK] — Thank you! We have a unique opportunity to raise funds for [INSERT NAME OF CAUSE]—as Paramount and INSTANT FAMILY are donating $1.00 per movie ticket to our cause. Please help us spread the word to see the film opening weekend November 16, 17, 18 (sales count through Dec 2nd). Tickets are on sale 10.26.18! For sales to count: Get tickets at www.Filmraiser.com. Select [INSERT CHARITY NAME]—and you will checkout via Fandango. Thanks you! FilmRaiser works at ANY MOVIE THEATER where tickets can be bought on Fandango. $1.00 from every ticket comes back to your cause—to any showing on Thursday, Friday, Saturday or Sunday of opening weekend [or longer if stated so] for the film being offered. It all adds to the your earnings! After opening weekend—we tally the box office sales and mail a check to you. And runs ALL OPENING WEEKEND LONG. We will notify when new movies become available as fundraisers. 2-3 per year. We'll send you some great studio art (digital posters). Then you simply send people to www.FilmRaiser.com. When they select your cause from a list—a unique link will pop up. Any tickets to the movie bought through that link track back to your school! DoES FANDANGO work in your city? Enter your city on FANDANGO to see if theaters in your area are supported. Our sincere apologies if your community is not supported yet. FANDANGO works almost everywhere in the U.S.